Setting: Church leaders traveled from town to town helping to establish new congregations. They depended on the hospitality of fellow believers. Gaius was one who welcomed these leaders into his home. Key verse: "Dear friend, you are being faithful to God when you care for the traveling teachers who pass through, even though they are strangers to you" (1:5). Attended to things that made for a godly inner spiritual life (2). Was well regarded by other believers for his life and activities (3). 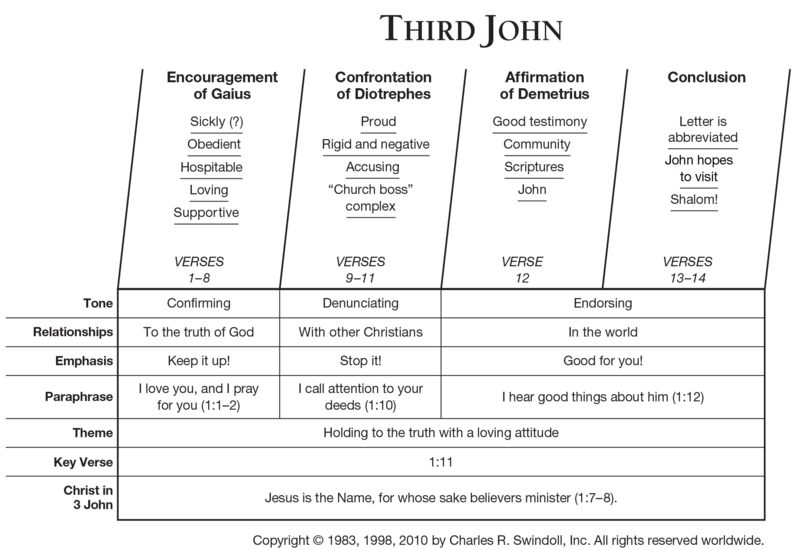 Made truth central to his communication (3–4). Showed hospitality to believers and others (5–6). Showed generosity to traveling gospel workers, freeing them from dependence on outside sources (7). Did not aspire to fame or an exalted position in the fellowship, in contrast to others (9). Did not welcome John’s communication (9). Demeaned John’s reputation with malicious information (10). Was not hospitable to other believers (10). Hindered others in the congregation in their desire to be hospitable (10). Expelled believers who resisted his activities (10). Susan is a sales representative. She can make a big sale, but only if she mildly deceives the customer. She decides to tell the truth and she loses the sale. Should she expect God to honor her integrity by helping her make an even bigger sale in the future? A contractor is deciding whether to award a job to Allen’s firm or to another company. Allen really needs the business. So he prays at length that he will get the contract, and asks others to pray, too. Should he anticipate that God will somehow make the contractor award him the job? If not, should he expect God to arrange for other work to come along soon? John and Joan are reviewing their finances. John has recently received a small bonus from his company, and they’re wondering what to do with it. They finally decide to give ten percent of it to their church, and another ten percent to a mission. Can they expect God to bring them more money as a result? It encourages perverted motives. God wants us to seek Him for His own sake, not for a “payoff” of physical well-being or financial gain. The reward of loving obedience is a closer relationship to God (John 14:15–18, 21–23). He also wants us to be content with what He provides us, not greedy for more (6:6). It misinterprets God’s deepest concerns for us. If God wants us to have abundant material benefits, if He sees that they would be in our best interest, then we can trust Him to supply them. Otherwise, such “blessings” would be harmful. God loves us too much to destroy us with what we don’t need or can’t handle. It misrepresents God’s promises in Scripture. The Old Testament offers plenty of promises about material prosperity and blessing. But for the most part, those benefits were offered to the nation of Israel, not to individual believers. Furthermore, God’s promises are always offered to those who truly love Him, seek His will, and obey Him from a pure heart. The Lord Himself is always the end to be sought; material benefits are never an end in themselves. Word in life study Bible . 1997, c1996 (electronic ed.) (1 Ti 6.3). Nashville: Thomas Nelson. John wrote to commend Gaius, who was taking care of traveling teachers and missionaries, and to warn against people like Diotrephes, who was proud and refused to listen to spiritual leaders in authority. If we are to live in the truth of the gospel, we must look for ways to support pastors, Christians workers, and missionaries today. All Christians should work together to support God's work both at home and around the world.